Your research proposal may be a part of your dissertation, submitted in advance, or submitted as a separate piece of work. You may also be required to write a research proposal as part of a grant application. Whether or not you are required to submit a research proposal before your dissertation, it is good practice to summarise what you plan to do, and why, before you start as it will help to keep your research on track. A research proposal is a document in which you outline the case for undertaking the research project, your dissertation or thesis, and present your plans for carrying out the work. It is needed to persuade supervisors, funders and other stakeholders of the value of the research and the likelihood that it will successfully be able to answer the research question(s). An introduction outlining the topic and questions for investigation, as well as a brief literature review and theoretical framework. A detailed strategy explaining what the research methods are, what data will be collected and how access to data sources will be obtained. A realistic timetable for completion, showing key milestones and when they will be accomplished. You will be working to deadlines. Discussion of logistical and ethical considerations. Limitations of the proposed research. An indicative bibliography of references consulted to date on the topic. In addition, when a research proposal is made to a funding body or when plans for communication are not implicit in the project (e.g., when the research is undertaken for a dissertation), then it is usual to include a detailed budget and a description of the communication plans in the proposal. The first step in any research is to identify the topic of interest. Think about which areas have most interested you in your studies to date, and what you would most like to explore. Then start to read around those subjects to narrow down the field of interest. Now is a good time to identify a possible supervisor and talk to them about whether they would be prepared to supervise you and help you narrow down your research topic. As a general principle, it is better to research a narrow topic in more detail than a broad one in very little detail. Start to write up your research proposal as you read around your subject. Summarise the texts that you read and group ideas into themes as you go, not forgetting to reference very carefully. It is much easier to take irrelevant text and references out later than to add them in and remember where the ideas came from. Once you have identified your field of interest, you can then start to identify one or more research questions to answer. Again, a narrow question that you can research in detail is better than a broad one that you will not be able to cover in full. Your research question(s) should be ones that have not been fully answered in previous research so that you are adding to the literature. However, you want your literature review to have at least something to report, so an area where there is already plenty of research is better than a completely new topic. You can always find a sector, study group, or other unique element that will make the research worthwhile, even if others have done similar studies before. Thinking about your research topic, ask yourself it is that you actually want to find out? Frame it as a question that you could ask somebody: good research questions often begin with asking words like who, what, when, where, why, how, and how much. Once you have brainstormed several questions related to your topic, look at each one individually against the following checklist of considerations. Is there a social or practical value in knowing the answer to this question? Is the scope of the question specific enough that you would realistically be able to answer it within the limits (time and cost) of the project you are going to undertake? If not, you may need to narrow down the focus even further. Does the question suggest the kind of information you would need to answer it, and how you would go about getting that information? Would it be feasible to get the information necessary to answer the question? By the time you have finished developing your research question(s), they should be tight and carefully defined, including a clear idea of the sector or area of study, study population, and what someone will know after reading your research. Once you have a topic, and research question(s), then you can decide on a title, which should broadly cover your research question(s) and summarise what you are going to do. It’s fine to change your title later on, or at least to tweak it, so consider this a working title for now. 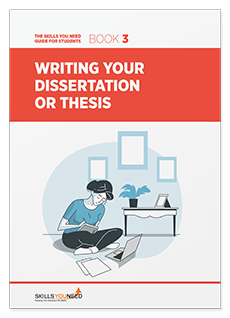 You can and should use your dissertation supervisor as a sounding board as you develop your thinking, although beware of bombarding them with enthusiastic and/or panicky emails. It’s usually better to ask for a meeting to discuss your ideas, rather than trying to have a discussion by email. Keep a note of ideas and questions, and then send a single email to your supervisor requesting an appointment, and setting out your broad thinking, preferably with your outline research questions. Your supervisor will soon make clear whether they think your ideas are too broad for study and will hopefully help you to narrow them down. Once you have defined your research questions, you need to set out broadly what you plan to do to answer them, and why. Everything that you do should have a clear reason ‘I thought it might be fun’ is not considered good enough. How you will analyse the results, with good academic reasons for your selections. This section is designed to show that you know what you’re going to do, and why. It will also serve to show whether you’re trying to do too much/too little, which your supervisor should point out to you at an early stage. See our section on Research Methods for more about how you may go about conducting your research. Any study involving human or animal subjects will need ethical approval, which will usually be from the university’s ethics committee. There is likely to be a standard form to complete, which you may need to submit as part of your research proposal. Check the university’s requirements, and if necessary consult your supervisor about what to include. Will research participants include any of the following groups? Approximately how many participants are to be recruited, how will they be selected, and how will they be invited to participate in the study? Are there any links with the investigator (client, friend, etc.)? If there is a link, detail what safeguards to preserve objectivity and to prevent conflicts of interest are in place? Describe briefly what will happen to the participants (e.g., interviews, questionnaires, the anticipated nature or duration of each). Give examples of the sort of questions you intend to ask. Are any risks, potential hazards, stress, discomfort or inconvenience to participants anticipated? What steps will be taken to minimise any adverse impact of the research on participants? Will you provide written information to participants indicating the nature and purpose of the research, that their participation is voluntary, that they may withdraw at any time, and provide contact details for further information about the study? What steps will be taken to safeguard the anonymity and confidentiality of the participant’s records? If you are submitting a grant application, or research proposal to a university, you will probably have a maximum word count or be given an acceptable word count range. It’s important to stick to the word count. If the maximum is 2000 words, and you’ve written 500, you probably haven’t provided enough detail. On the other hand, if you’ve written twice as much as expected, then you’ll need to cut it down considerably. Always check your university or grant-awarding body’s guidelines to make sure that you’ve included all the necessary information, and that this is in the required format. It is extremely annoying to have something rejected, or have to rewrite it because of a formality like the font size. See our study skills page: Assignment Finishing Touches for some general ideas about presentation and formatting your work.